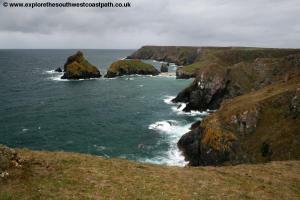 This walk begins from the southern tip of the beautiful Lizard Peninsula and heads west along this rugged coast taking in Kynance Cove and Mullion Cove. West from here the coast becomes less rugged and with more beaches, including lovely Poldhu Cove and ending at the large expanse of Porthleven Sands, which runs for several miles. From the main A30 road through cornwall take the A39 south towards Truro and continue on the A39 as it runs round the south edge of Truro. From Truro keep to the A39 towards Falmouth and then when signed turn off onto the A394 for Helston. Just before Helston take the A3083 to Lizard. 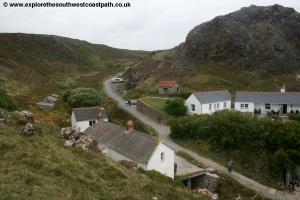 Care is needed as some of the roads on the Lizard are quite narrow. The car park in Lizard is in fact the village green and at the time of writing payment is via an honesty box. If you are coming by public transport Lizard village is served by Western Greyhound bus 537 which runs an hourly service Monday - Saturday from Helston to Lizard Green via Mullion. The bus runs once every two hours on Sundays. At Helston there are regular buses between Penzance and Falmouth if you are travelling from further afield. Lizard village is not an especially big place so the choice of accommodation is fairly limited. 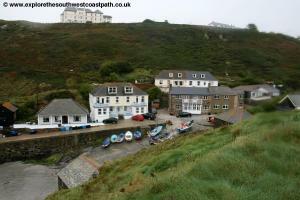 At Lizard Point is Lizard Youth Hostel which offers wonderful views and low cost accommodation. A more expensive option is The Atlantic House B and B although single night stays are only available on standby. THe Penmenner Guest House offers bed and breakfast accommodation or you could stay at The Top House Inn. Finally there is also a campsite in the village, Henrys Campsite. There is a wider choice of accommodation in Helston and numerours holiday cottages, bed and breakfast and campsites over the Lizard Peninsual. 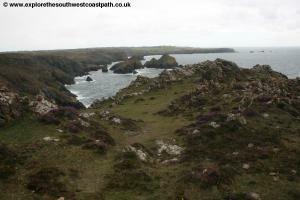 Cornwall does well for extremities of England with the most South Westerly point Lands End and the most southerly point, Lizard Point close to the start point of this walk. The walk begins in Lizard village by the village green (which is also the car park). From the village green head south with the little supermarket on your right and the stone shop on the left, along The Square. At the large junction ahead turn right along Lighthouse Road. As this comes to a T-junction turn left along Penmenner Road. As the end of the road, by the Penmenner House Hotel continue on the track ahead, which now becomes a bridlepath. 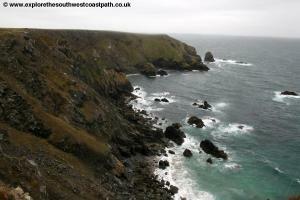 Continue on the bridlepath until you reach the coast. 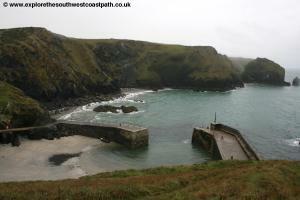 To the left you have the lifeboat station at Lizard Point. 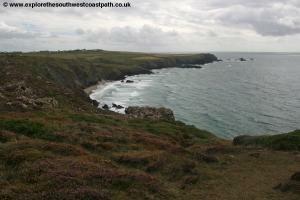 Looking south you can enjoy the views out to sea from the most southerly headland. 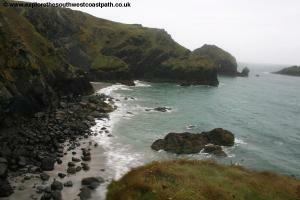 Turn right along the obvious coastal path as you soon turn right with the coast to start heading north. 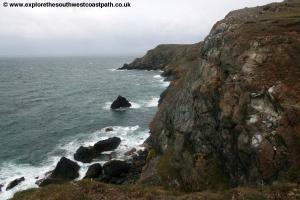 Soon you reach the little rocky cove of Holseer Cove and just beyond it the larger cove of Caerthillian Cove. Passing this you soon come to Pentreath Beach, a sandy beach at low tide, but covered at high tide. 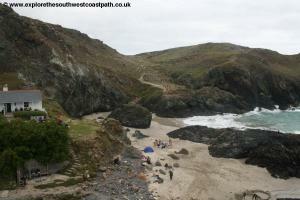 Continue along the coast path soon reaching the car park for Kynance Cove. 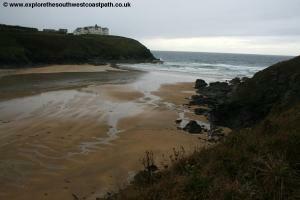 Keep to the left edge of the car park and take the main path leading to the beach. This is a beautiful beach, now in the care of the National Trust with the lovely azure blue waters and lovely sand although at high tide there is very little sand. There is a cafe at the back of the beach. 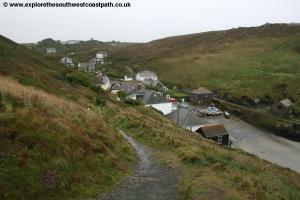 The route here is to take the steps down and along the beach and then up the road beside the cafe on the right, but turn left on the signed coast path before you come to the houses on the left. 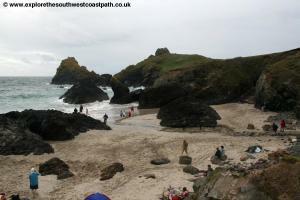 At very high tide, an alterantive route is signed away from the beach, but it is better to use the beach if poissible. 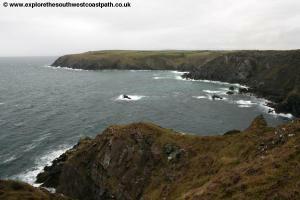 The path for the next mile or so is very obvious, just stick to the cliff top along Kynance Cliff. 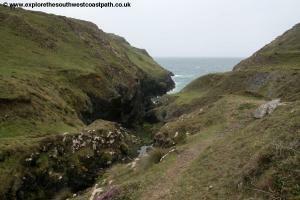 This part of the path is also not demanding as it is very flat and offers lovely views west and around the coast. 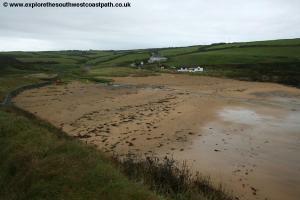 Soon you come to another little cove, Cew-graze, which has a sandy beach at low tide. 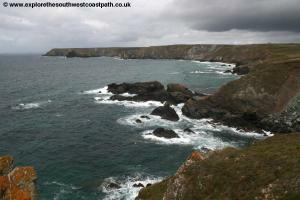 Continue round Vellan Head, passing George's Cove and on to the rocky beach at Parc Bean Cove. 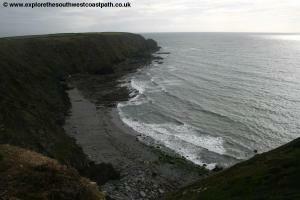 From here the coast path is easy to follow, just stick to the main coast path right along the cliff tops. 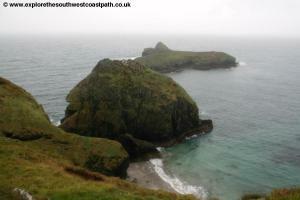 Soon you can see Mullion Island just off the coast to your left. This island is now owned by the National Trust. Ahead you have to descend and climb back up the valley at Predannack Cliff. 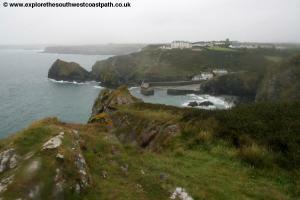 Climbing back up to the cliff top you soon have Mullion Cove ahead of you. 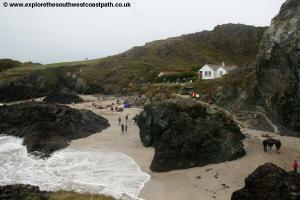 This is another popular spot and another village owned by the National Trust. 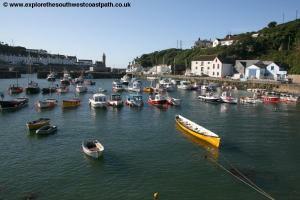 It has a small harbour and sandy beaches to the south of the harbour. 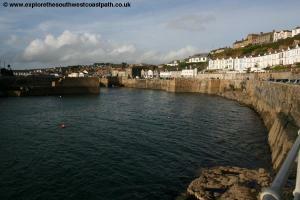 Descend round to the cove and follow the road along the south side of the harbour. 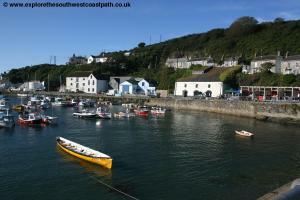 Once at the back of the harbour, go round the harbour and then take the coast path signed just past the cafe on the right. This climbs up and soon comes out to the road at the Mullion Cove Hotel. Walk along the road with the hotel car park on your left and to the little turning circle beyond. At the turning circle turn left on the path and follow this as it soon becomes a track with houses on the right hand side. 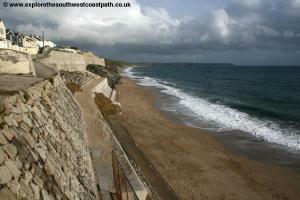 As the track ends at the public road, turn left on the signed coastal path. This goes to the left of the tennis court of the large hotel on the right. After the hotel keep to the path ahead as you go down steps to the valley leading to Poluriian Cove, another good sandy beach. On reaching the wide track at the bottom turn left for the beach or cross and take the path ahead to continue on the coast path. 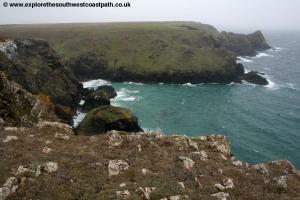 Go up the steps and then turn left to keep to the coast path. You now keep to the coast path on the left of a fence to the right soon passing a large building on the headland at Poldhu Point which looks as if it was once a hotel but now seems to be private. 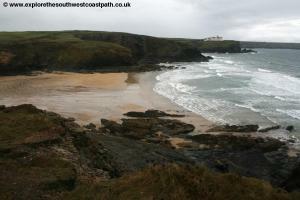 Ahead you have the glorious beach of Poldhu Cove. 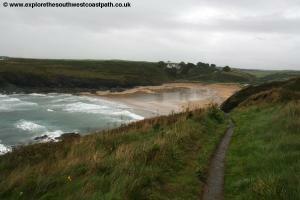 Follow the path round that soon joins the private road leading to the building on the headland which you follow down to the car park. On reaching the road turn left and take the road behind the beach and then at the north side of the beach at a junction turn left on the minor road (signed as a dead end). Continue along this narrow road, passing a house on the left and keep going until it comes to a small car park with a golf course to the right. 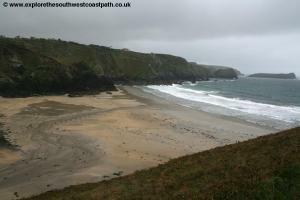 Go through the car park and continue on the footpath ahead which soon descends to another lovely sandy beach, Church Cove. 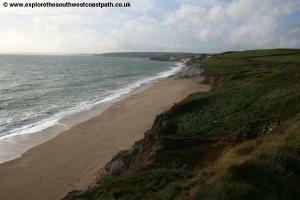 Walk along the back of the beach and take the path to the right of the church. This heads up hill soon coming to a farm and shop on the right with car park and public toilet just beyond it. Opposite the farm turn left and climb up the little steps over the wall and then turn right along the back of the beach and along the footpath. 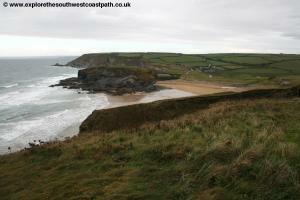 This soon joins a wide farm track, but only very briefly â€“ very soon you turn left back onto the coast path. Follow this around the edge of a couple of fields, still keeping to the cliff top and soon pass a little parking area for Halzephron Cove (Cornish for 'Cliff of Hell') on the left. 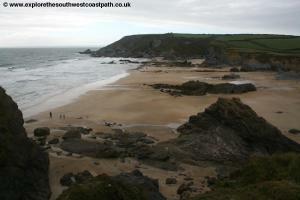 There is some sand here at low tide but the beach is very rocky and there is no access from the coast path. The coast runs parallel to the minor road along the back of the beach here until you get to a large white house ahead beside the road. Just before this you turn left on the path beside the fence around itâ€™s garden, behind the garden and back to the cliff top. Pass through this field along the cliff and then head straight ahead, just to the right of a house and just past this house you continue on its access drive to reach a minor road. 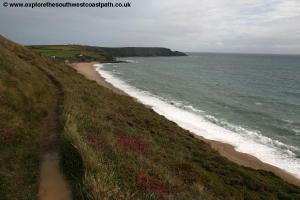 At the minor road you can turn left to walk along the lovely beach, known as Gunwalloe Fishing Cove, but itâ€™s really the south end of Porthleven sands which we follow beside the rest of the way to Porthleven. At the minor road go on the left hand edge of the houses, right on the cliff top. 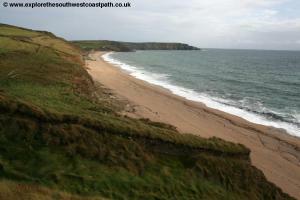 For the next mile or so the walking is very easy, you simply follow the gently undulating cliff top path beside this lovely beach. 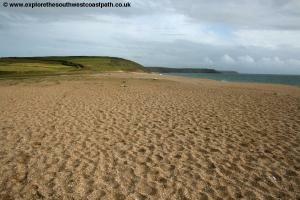 The sand on the beach is a coarse sand and the length of it means it is rarely crowded. 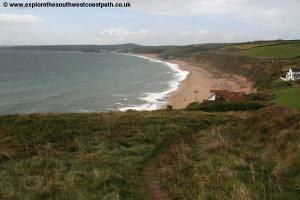 Soon the path descends down onto the beach as you reach Loe Bar. This is a natural sand bar with the freshwater lake of Carminowe Creek on the right hand side. Permissive footpaths run along each side of this lake taking you to Helston. 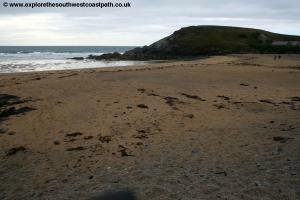 To continue the walk, cross this sand bar (which can be hard going, especially after walking from Lizard) and at the other side take the track back up onto the cliff top. 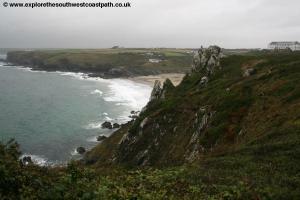 Â You continue on this easy cliff top track for around half a mile until you reach a small car park. Here the track becomes a public road, which you continue along, passing a couple of houses on the left. 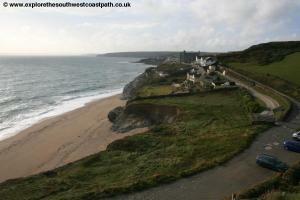 After this ignore Coopers Lane on the right and continue on the lower track nearest the coast. Soon the houses of Porthleven line the road and you pass cottages on the right, still with fine views over the coast to the left. As the road splits ahead you can take the little lower track, Mounts Road on the left, or continue ahead on Loe Bar Road (they soon join up again). 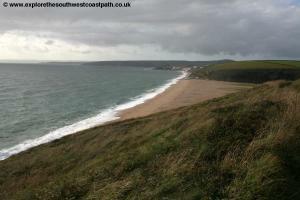 Continue on this narrow road, Loe Bar Road as it soon starts to descend towards the harbour. When the road ahead is marked no-entry continue along it (the no entry only applying to vehicles). 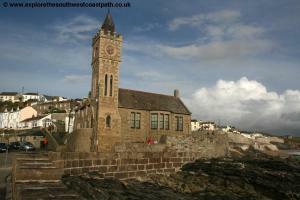 This soon descends past the town hall on the right (which looks like a church) and rounds the harbour. Continue on this road beside the harbour passing the outer harbour and continue beside the inner harbour, passing the Harbour Inn on the right. Continue to the main road and turn left behind the harbour. The bus stops are along this road at the back of the harbour. To return to Lizard requires two bus services. From Porthleven take First Devon and Cornwall bus number 2 or 2A to Helston. This runs hourly Monday – Saturday and once every two hours on Sundays. The journey takes around 10 minutes. Alight in the main shopping street in Helston and cross the road to the bus stop on the other side (near The Blue Anchor) and then take Western Greyhound bus number 537 to Lizard Green. This runs hourly Monday – Saturday and once every two hours on Sundays and takes around 45 minutes to get back to Lizard Green. Here are some photos of the walk. Click each picture for a larger version and description. 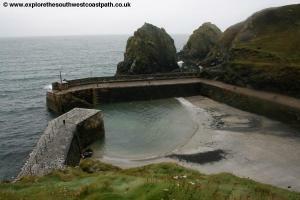 Sadly there was a lot of rain around Mullion Cove which has got onto the camera lens on all the photos in that area. 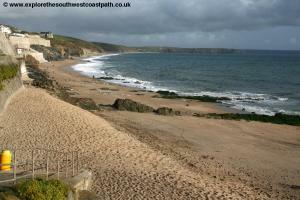 Ordnance Survey Landranger map 103 covers the coast between Lizard and Porthleven. 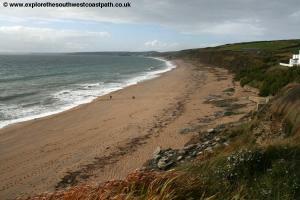 In addition the following links show the ordnance survey maps of the coast between Lizard and Porthleven.